As you all know, I'm not much into audio books around here. (That's because I'm not much of an audio learner.) But I do enjoy the Focus on the Family Chronicles of Narnia Radio Theatre series. We have the complete set and Bookworm1 is working his way through them. He really enjoys listening to them. (I half-listen.) 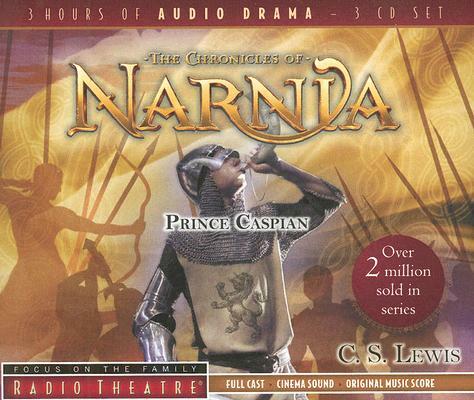 I picked up a copy of just the Prince Caspian Radio Theater production at our local Christian book store for the purpose of sending it to one of you during the Chronicles of Narnia Reading Challenge. Would you care to win this? Simply leave a comment below. This contest is open to U.S. and Canadian residents. If you are participating in the challenge and have written up a post on your blog saying so, you may leave TWO comments for two separate entries. This contest will be open through Thursday, July 26th. THIS CONTEST IS NOW CLOSED. The winner, as selected by Random.or, is #4 - Joyful Reader! :) Hehe! I think both kids would enjoy listening! THough I must say I would enjoy the whole collection. Derek prefers the radio theater, too. And I did finally write up my post! I was only going to read The Magician's Nephew but then I decided to continue so I am currently in The Horse and His Boy! My son, grandson and I all love the Nardia series and go to the movies as soon as they come out and do not move until the end of the movie. My son has all the books and my grandson is seven years old and just starting to read the books! This would be a great treat for them and me too. I'm not sure M is quite up to this listening level yet, but I would love it for when he is there. Our church gave all the kids attending VBS this year a cd of the music and he LOVES to listen to it in the car. Any recommendations for music/audio books at this age level? My five year old would LOVE to listen to Narnia in his afternoon quiet time. Thanks for doing this! Thank you Lord for Narnia!! I remember listening to my 5th grade teacher reading The Lion, Witch and Wardrobe to me. We discovered audio books were great for the car after our DVD players broke on a cross country move. We LOVE the Focus on the Family audio recordings. We had samples of some of their other series. I hope I win! Would love to have this for my grandchildren, as well as other children in my life. My son and I love the Narnia stories. What a great giveaway! Um, heck yeah, we'd love to win it! We love the Narnia books, this would be great for in the car :) Thanks for the chance to win it! Love the Nardia Books and movies and would love to win a copy the Prince Caspian Radio Theater[Image] production!